I've made a list of all the things I want to work on during my #3YearPlan. At the top of the list is to exercise regularly and to eat healthier because if I do those two things everything else will fall into place. I want to be healthy enough in three years to do anything I want with my life, including traveling, maybe even buying a travel trailer. On August 11 it will be my one year anniversary since I did my very first ride. I take this date as a sign because it was exactly, to the very day, 6 months before my 49th birthday. Later I made it my goal to reach 100 rides by my birthday and I did. Now my new goal is #200ridesby1year! I want to have completed 200 rides by my one year anniversary. My one year anniversary on August 11 will mark exactly 6 months until my 50th birthday on February 11 Once I accomplish the 200 rides goal I want to set a new goal to reach #300ridesby50. First things first. I have to get motivated again! I took a long break after I had my cardiac catheterization because the entry points were in my groin, on each side. But I got right back on after that break and I came back strong, completing my first goal. After that goal and my birthday trip to Las Vegas something happened to me. 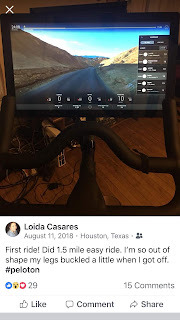 I became completely unmotivated, even when others told me I had motivated them and they bought a Peloton or were considering it. I hurt my left rotater cuff doing the weights but that shouldn't have kept me off the bike too but it did. I kept thinking I would just take a week or two off and then before I knew it that time became longer and longer. Well no more excuses. I'm back in the saddle again and on my way to 200 rides. Now that the time has changed and I'm coming home when there's daylight I want to start walk/running again on alternate days. I want to make this a real lifestyle and I don't want to take long breaks in between. This has to become my life until I can't do it any more, because that day may come. We can never be certain of our life and we shouldn't take our health and what we can do right now for granted. 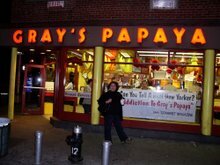 I don't know what the future holds for me health-wise with my family's history. I know I've said these words before but since I got the Peloton this has become more real and attainable because I know I can do it. The Peloton made me believe in exercise again and really changed my relationship with exercise. I know I've already said that but I will say it again. I've kept my weight down and I am very confident that it will just take a few rides to build back up to where I was. So here's to 200 rides! 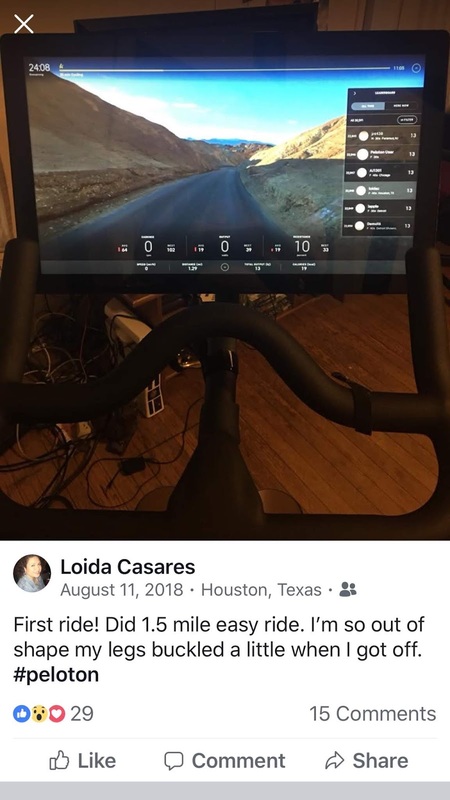 Fellow Pelotoners, who is with me?